I have been blessed with three major events in my life that have indelibly imprinted on me the keys to empower myself to always be able to move forward to fitness and health. First, I jumped at the opportunity to tryout for the 1976 Olympic Games in rowing. In the months and years leading up to the Games there was a never ending challenge to be fitter and perform more effectively. Even though I was not the best athlete in the bunch, I made a vow to do everything that I could. When I felt I had given all I could give, I found more! Often life circumstances demand that we dig a little deeper to create fitness; this is what I help my clients do. In the end I became the lead rower in one of the top boats for Canada. We did not win the medal against boats from Russia, East Germany, and Rumania who were far more experienced, had much better equipment, and proven to be on steroids. However, in the end East Germany and Russia stood in front of us and bowed, acknowledging us for our fearless tenaciously to move forward in spite of all odds. This is where I learned the most important lesson that I teach all my clients….. If it is to be, it is up to me! The first year I could not really move. Then I staggered for years, couldn’t speak for a while, lost my vocabulary and my memory… and was totally engulfed in rage. To lift my leg to step up on the curb required enormous effort. Something like taking a bath was so exhausting that I had to recover in bed for five or six hours. This went on for years. This sounds bad, and it was, but I have since experienced so many other souls who face circumstances even worse. One thing I did have was that fearless tenaciously to move forward in spite of all odds. For me it took 15 years to recover, but I did it! I was amazed how able the body was to improve given the right circumstances. It seems the body is so willing to improve given the right circumstances. The other thing that happened was that all of my “friends” left and my family died. I was depressed and suicidal. So finally I prayed for an answer and it came! I needed a worthwhile purpose, something to live for. This is essential. For me it was the gift of compassion and empathy that I learned in my 15 year struggle. Those clients who come to me for help now all are highly motivated to get fitter! With their circumstances they feel like they have run out of options and no one understands them. Can you relate? Are you struggling with something now and don’t know how to break through? I surround my clients with compassion and empathy partnered with the impetus to dig deep and just do it, knowing that everyone can improve. Third, in 2009 I lucked out and was chosen to be one of the 2010 Winter Olympic Torch Relay runners. My main goal was to look good on TV…hahahahhaaa! I decided that potentially the easiest way to accomplish this goal was to pole walk. Within 45 days people started noticing that my posture had changed and I looked slimmer. Pole Walking worked! After the TV appearance, I continued pole walking just because it felt good. (It’s like cross country skiing but on pavement). Season after season, new fitness results kept showing up! Don’t you just love it when a product or service actually delivers on its promise? Isn’t that what we are really searching for…something that actually works? This Torch Relay experience led to my discovery of a total body fitness exercise that really works. It worked for me and it works for each of my clients! It will work for you too. In 2011 people started asking me to teach them how to get results like I was getting, so I set up workshops. At the end of the first year, I got a phone call out of the blue from Dr. Klaus Schwanbeck in Berlin. He envisioned me becoming an instructor with his newly formed company, Nordixx Canada. I accepted. After reading all the scientific studies proving how effective Nordic Pole Walking is in reducing most life style diseases, I was ecstatic. SCIENCE PROVED THAT POLE WALKING POSITIVELY IMPACTED ALMOST ALL THE LIFESTYLE DISEASES! Pole Walking REALLY delivers a big promise! Since then I have taught thousands of clients and witnessed the fact that EVERYONE who takes up Nordic Pole Walking improves their fitness and health! It’s a rare joy to find something that actually delivers its promise….that’s Nordic pole walking! Can you feel it? Because the three major events in my life, I now empower people to take action for their own results. I make a fool of myself every day extoling the virtues of Nordic Pole Walking to any audience willing to listen. I go crazy when people blame the doctors for not doing enough when they allow their own fitness to decline. It is thrilling to continue Dr. Schwanbeck’s vision “creating a legacy of health through fitness with Nordic Pole Walking” by offering lessons and courses, and by certifying others to become Nordic Pole Walking leaders. LINDA SCHAUMLEFFEL IS A PROGRAM DESIGNER, SPEAKER, AND WORKSHOP FACILITATOR. A shining example of success, Linda competed for Canada in the 1976 Olympic Games in rowing AND reconstructed her body and life after a car accident in 1989. Full of empathy, compassion, and persistence, Linda loves to empower people to take action for their own results… especially health. Individuals, groups and organizations often hire Linda to design and deliver workshops to assist their members to achieve the health, fitness, and productivity goals they desire. Linda is also a popular inspirational speaker. 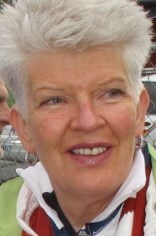 Happily joining Dr. Klaus Schwanbeck in April 2012, Linda is now Nordixx Pole Walking Canada Master Instructor in Victoria. Her duties include leading the growth of Nordic Pole Walking, teaching individuals how to Nordic pole walk, and certifying/training new Noridc Pole Walki Canada Instructors and Peer Group Leaders. Living in beautiful Victoria, BC, her most joyous hobbies are singing in the Victoria Arbutus Singers, and making “Pop-Up” art pieces to illustrate lessons learned in life. Go Girl! Dear Linda, Nordixx Master Instructor in Victoria, BC. LINDA is a Nordixx Pole Walking Canada certified instructor, and Nordixx MASTER INSTRUCTOR, Olympian, (retired), BCRPA personal fitness trainer, car accident survivor, B.Ed (PhysED, Psych).